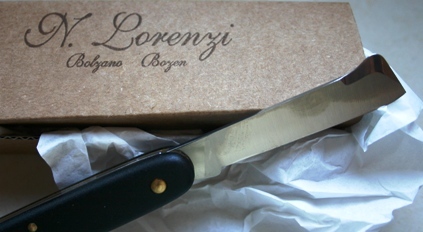 If you love to cook, slice, stab, skin or graft, this Italian kitchen shop is for you. Knives are a shop specialty with an impressive selection: Tiny paring knives, elegant steak knives, scary hunting knives, pocket knives in every size and shape, fish scaling knifes, wood-carving knives, and lots more. 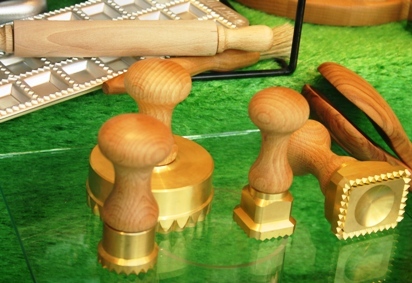 You’ll also find a wonderful selection of scissors, beautiful brass ravioli cutters, equipment for pastry making, hard to find kitchen utensils, and even a gleaming red antique prosciutto cutter, completely refurbished and ready to start slicing. I could have been tempted to buy at least half the goods in the shop, but I was on a mission. I’d been looking everywhere for a grafting knife, figuring that my failed attempts at grafting were at least partly due to using a rusty Exacto-blade. When I asked the salesperson if the shop had a knife for grafting trees, he didn’t hesitate a moment before inquiring what shape I was looking for, and was it for professional use? I was stunned and thrilled. More than one type? Me, a professional grafter? During my never ending house restoration project in Sicily, I was used to being regarded as a bit of a freak when entering the he-man realm of hardware & plumbing supply stores, and I silently thanked him for not trying to immediately show me some useless piece of girlie equipment. I asked to take a look at the selection. He patiently showed me 4 different grafting knives, the professional one being advisable if I had hundreds of trees to graft. Soon we were on a first name basis – Thomas turned out to be the owner’s nephew – as he explained the pros and cons of each knife and told me about the type his grandfather used. I held each of the 4 grafting knives, opened and closed them, and imagined slicing into the bark of a lemon tree. I picked the one that fit my hand best, which fell somewhere in the mid-range amateur category. Thomas wrapped it up nicely, like I’d just bought a pearl necklace. Many historic shops in Italy are in danger of disappearing, as rents in prime locations become too expensive or the big chain stores overshadow them. These small shops are an important part of Italy’s heritage, and once lost, can never be replaced. Shop owners Franco & Giuliano Lorenzi lamented the fact that so many small family-owned shops are closing in Italy. I encourage you to seek out these stores when shopping in Italy, and you will never be disappointed. You will most likely meet the owner or at the very least an enthusiastic salesperson, and find out a bit about Italy’s history, all the while purchasing something of quality that will bring back fond memories every time you use it. 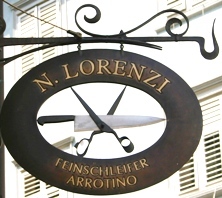 The N. Lorenzi shop does not have a website, but you can e-mail Thomas with requests at [email protected] or phone 0471 974706. Better yet, stop by their store at Via Bottai 28, where Franco & Giuliano will be pleased to assist you. Located in the center of town not far from the train station, with a second location at Via Goethe 36, which specializes in just knives and scissors. Bolzano is the gateway to the Dolomites of Italy, where we meet for our Wildlflowers in the Dolomites walking tour. Our meeting point and favorite hotel in Bolzano is the historic Parkhotel Laurin, walking distance from the station and all sites downtown, including the 5000 year old Ice Man mummy.